What's is the supply chain network design and optimization? 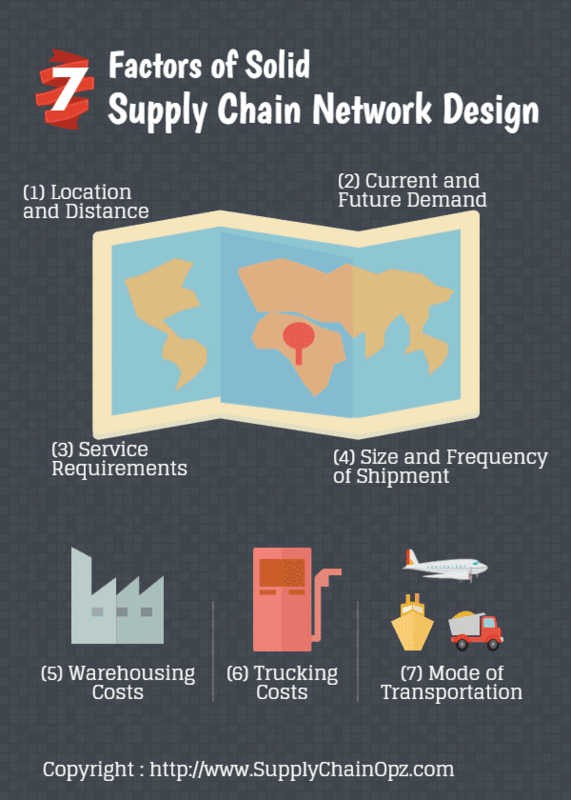 We will explain the concept and factors you should consider in the supply chain network design project. Many supply chain practitioners use the word "optimization" as the synonym for "improvement" or "enhancement". However, optimization is actually the mathematical technique aims to find the best possible solutions. Supply chain optimization is then the application of mathematical models to find solutions that minimize total costs or maximize overall profits. - How many warehouses a company should have? - Location and size of each warehouse? - Product assignment to each warehouse? - Which customer receives which product from where? You need this data to define the basic structure of the supply chain network. The location includes customers, suppliers, warehouse, manufacturing facilities, seaports, airports and so on. You can use the zip code or GPS coordinate to find a location. To find the distance between each point in the network, it can follow the straight line or the actual road contour. But, which approach is more appropriate? Once determining the location, you need to group the demand/supply points so you can determine the current and future demand. Anyway, how to group the demand points effectively? Things such as maximum allowable transit time or maximum allowable distance dictate the location of potential warehouses. These factors have the direct impact on cost (more frequency = more cost, smaller size = higher cost). Fixed cost is relatively easy to find but variable costs such as labor cost can be tricky because it is not static. Suppose you're dealing mainly with trucking, you need to find the appropriate cost data. LTL rates can be very complicated because of rates depend on "class", "exception" and "commodity". Moreover, the rate for "Boston to Chicago" may not be the same as "Chicago to Boston"
Since material flows from one point to another, you need to identify the mode of transportation that you're currently using. After the above data is collected properly, you need to construct a basic model and validate it. Model output, such as total costs, should be pretty much the same as in your real-world operations. Only after the basic model is validated properly, you then create and compare the possible alternatives that will help you cut costs or improve profitability. Since an optimization software usually runs the proprietary algorithm, it's quite difficult to make a real comparison excepts for other product features, user interfaces and computational time. As a result, the key to the success of supply chain network design project is the experienced consultants that help you to gather high-quality data, validate the model and propose the alternative supply chain structure that matters to your business. - Ballou, R. H. (1995). Logistics network design: modeling and informational considerations. The international journal of Logistics Management, 6(2), 39-54. - Ballou, R. H. (2001). Unresolved issues in supply chain network design. Information Systems Frontiers, 3(4), 417-426.